Our conveniently located, secure facility offers a warm, creative, fun-filled environment in our classrooms and in the three large playground areas. * Develop language, pre-reading, pre-writing and pre-math skills. Lakeside Lutheran Preschool's programs are based on the knowledge that a child's early years are ones of phenomenal development. Our chosen curriculum--Creative Curriculum--focuses on four key areas of development: social/emotional, physical, cognitive, and language. Our qualified, loving and dedicated staff strive to create an atmosphere that nurtures growth in all these areas. We believe children benefit when school and family work together to promote their child's learning and care. The preschool is an integral part of our congregation's ministry to young children and their families. 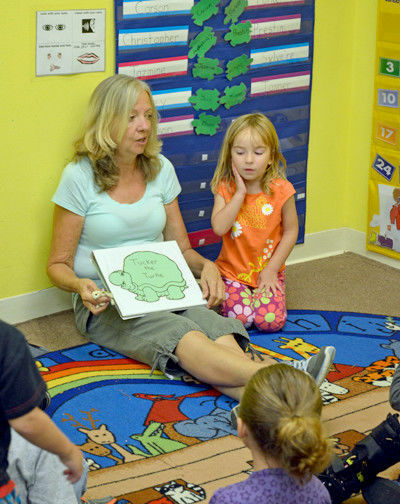 Lakeside offers one of the best Voluntary Pre-Kindergarten (VPK) programs in Sarasota County. We proudly graduate many bright young stars and future leaders. Every year, we host a graduation ceremony where children and families may gather to celebrate their rising-to-kindergarten stars! Plan to stop by for a tour of our facilities and see for yourself! Or call 941-497-5858 to learn more about our enrollment process.